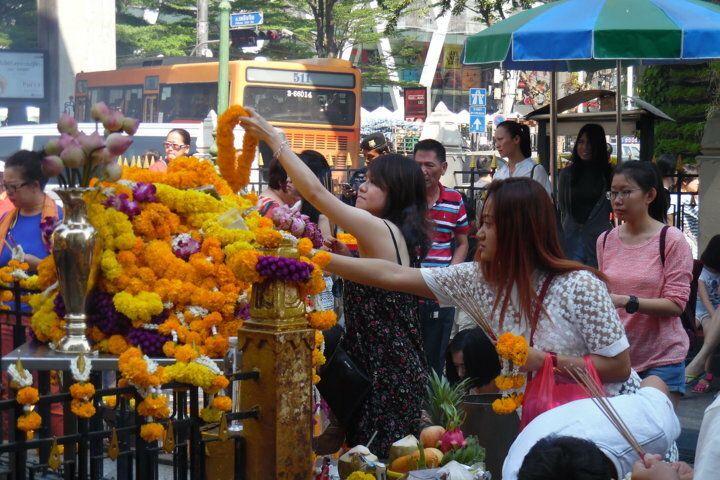 Bangkok is a very large and vibrant city that can be overwhelming at times. One spot to feel more at ease is in the sois (alleys) near Siam Square. It’s at a safe distance from the Greater Koh San Road Area and from the go-go-bars of Patpong and Nana Plaza. There’s little traffic and noise, there’s the quiet of a Buddhist temple and the buzzing of the Erewan shrine, there’s people on street level, there’s a mix of foreign tourists and local Thai, there’s easy access to all of Bangkok, and most important: there’s enough to do and see locally. It’s the latter I want to share with you. 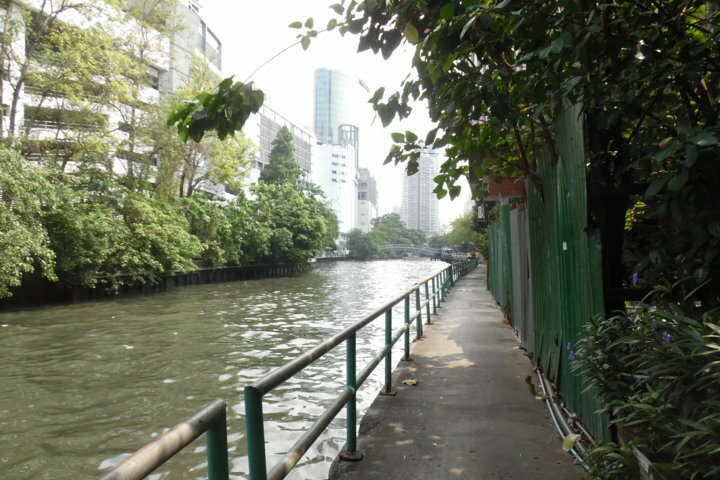 I'll concentrate on Kasemsan Soi 1, but Soi 2 and 3 are pretty similar (they have a northern pedestrian-only exit via the walkway along the canal). Kasemsan Soi 1 is in the northeast corner of the junction of Rama 1 rd and Phayathai rd, and connects to both of them. 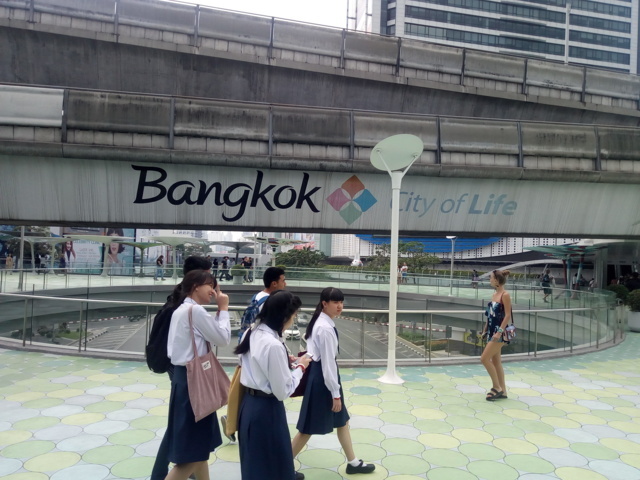 Above the Rama 1 / Phayathai junction is an elevated walkway, connecting the BTS, the MBK, the Art and Culture Center, Siam Discovery and the southeast corner. It's a great place to watch people and traffic. The Jim Thompson House in Kasemsan Soi 2 is a beautifully restored wooden Thai house. It hosts the Silk Museum. Erewan shrine is a small shrine that has become immensely popular. It’s simultaneously devout and peaceful, as well as lively. A gamelan orchestra enhances your prayers. It’s opposite the Central World shopping mall. A "river walk" along the north bank of the klang (canal) starting at Hua Chang bridge, going west until the Tesco Lotus (the walk ends at the parking garage entrance), will reveal a very different Bangkok. It feels like village life in the countryside. Siam Square has some big shopping malls with all the expensive international brands, but much more interesting is MBK. It has countless stalls with things you’ve never seen and didn’t know you wanted. Or you can explore the many small shops in the sois south of Siam Square, where the Thai go. A 20 minute walk up Petchaburi rd takes you to Pantip Pratunam, the computer gadget mall. Here you find electronics either cheaper than, or not yet available on western markets. It’s like a tangible Ali Baba website. Chalermla Park is a small open space that is popular with graffiti artists. It's over Hua Chang bridge, east side of Phayathai road, before Co-Co Walk. A slightly longer walk (1 hour) is from Lumphini Park to Benchakiti Park via a footpath / bicycle path. There are some beautiful and quiet spots along the way. You can start at Sala Daengi BTS, end at Asok BTS. If you're hungry by now, have lunch at Suda in Sukhumvit Soi 14. See the map below for the itinary. Hidden behind a green wall of potted plants in Kasemsan Soi 1 is Pisces, run by a lovely Thai lady. They do freshly cooked dinners and curries, some with an Indian touch to it. Lily's favorites are the masamam curry and the glass noodle salad. Semi-outdoor seating. Wang Mai café on the stadium premises does hot and iced coffees. It’s right next to MBK and the BTS on street level. It's a small stall overlooking a soccer court. Despite the traffic noise it feels like an oasis. The MBK food court on the 6th floor (zone A) does cheap and tasteful dishes. There are a couple of vegetarian stall (B04, C07). C07 is Lily's favorite for a fabulous lunch. At night C07 has less choice and you may consider B04 as they cook to order. Buy coupons first, or use your Rabbit card. Inter is a diner style restaurant in Siam Square Soi 7. It is very popular with the locals. That says it all. Worth queueing up for. Over Hua Chang bridge, east side of Phayathai road, is Co-Co Walk, a small strip of cafes and restaurants catering for local Thai. Grandmother's is Lily's favorite for dinner. Kasemsan Soi 1 has a wide range of accomodation. First is the large Chinese hotel Muangphol Mansion, rather dated but great views and reasonably priced. The Reno hotel is a more pretentious midrange place, with a pool and a cafe. In the middle of the soi are the White Lodge and the A-One Inn, sort of budget places, considering the location. The LiT Bangkok is the most upmarket place on the block, 4 star, swimming pool, the lot. Wendy House is a very pleasant midrange hotel. The rooms are smallish and a bit dated, but the friendly staff and good atmosphere are the best. The place is immaculately maintained. BTS stop National Stadium is right in front of Soi 1, but the Siam Square BTS junction stations is also close and brings you to all BTS stations directly. Prayathai terminal, for the airport train to Suvarna Bhumi, is just a ten minute walk if you exit Soi 1 on the northwest end and cross the bridge. An easy way to cross the road is to pass under the bridge. For Don Muang airport you can take an ordinary train from Hua Lamphong. Or take the BTS to Mo Chit, use exit 3, and airportbus A1 from there. Or airportbus A2 from Victory Monument. Hua Lamphong train station for long distance trains (all except Kanchaneeburi) is two stops on the BTS and then two stops on the Underground (MRT). The junction is Silom. Unfortunately BTS and MRT have separate stations and separate tickets, so this is not convenient. City busses 21, 34, 73 and 529 serve the train station too. If you travel light you can walk to Hua Lamphong in 30 minutes. The canal boat stop Hua Chang Pier (jetty) is this side of the bridge (sort of under it). 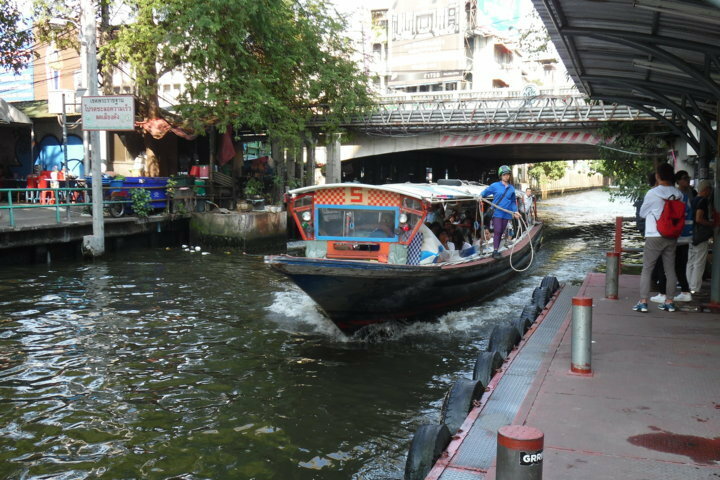 The boats are an adventure in themselves and a good way to get closer to the Grand Palace area (though that is still a 30 minute walk from Phanfa bridge, the last stop). Getting off at Bobe (Bobae) Market should give you a transfer to the ferry up and down the Krung Kasem canal, but this is unconfirmed so far. Victory Monument is two stops on the BTS or half an hour walk. Beware this is no longer the terminal for minivans to towns around Bangkok. The minivans now depart from Mochit New Van Terminal, on Kamphaeng Phet 2 Road, under the Si Rat expressway. To get there, take the BTS to Mo Chit, and bus 9 or A1 to the main bus station. Walk 5 minutes from there. Click the map to go to a customized google-map, showing main public transport routes, walking tours, main sights and selected restaurants. The walking routes allow lots of shortcuts. On a small screen, tap the title to see key to map symbols. If you are signed in to google, you can use the map to navigate.